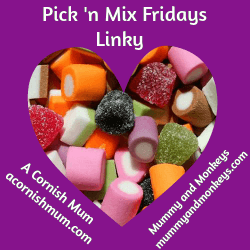 Recently I’ve been switching to organic products for my children wherever possible and I’m so glad I have. This organic shampoo and conditioner from Green People not only smells amazing but it also doesn’t contain any of the nasties that many other shampoos and conditioners do. I’m a big fan of Green People products, we’ve tried their sun lotions and hand sanitiser before and love them. Their products are really good quality and are kind on my children’s sensitive skin. 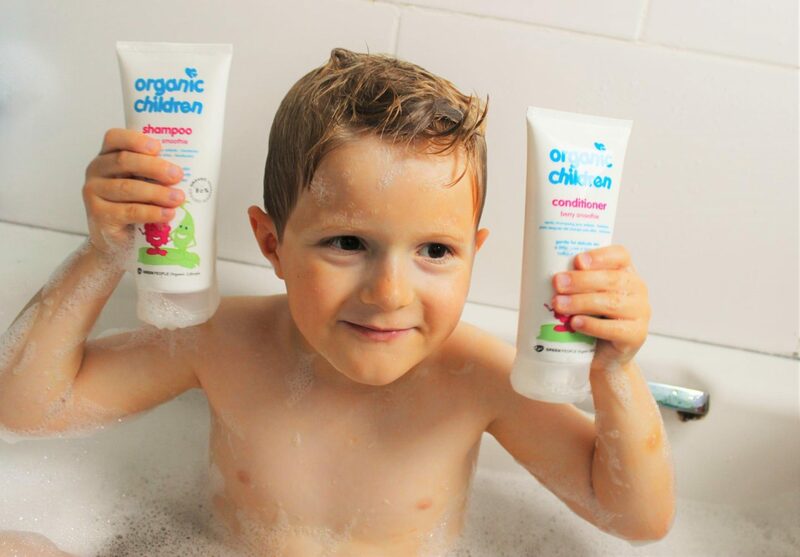 I like using organic products on my kids as they both have very sensitive skin, Max in particular as he has eczema. Green People organic products are kind to their skin and do not cause any irritation or eczema flare ups. Did you know that children have thinner and more absorbent skin than adults? Which makes it a less effective barrier against chemical toxins. Research suggests the rates of eczema and allergies among children are on the rise and the early introduction of harsh toiletries onto sensitive skin may be a factor. 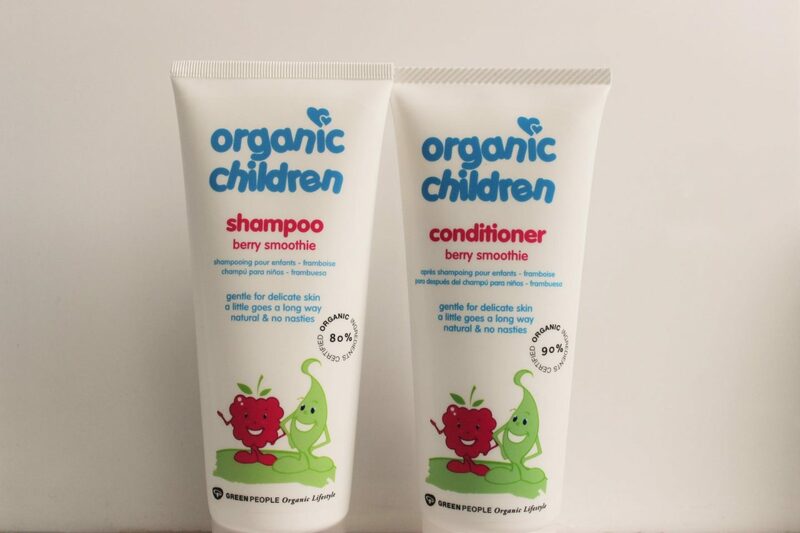 As with everything from Green People, the Organic Children range is naturally free from petrochemicals, SLS, Parabens, phthalates and synthetic fragrances, plus they are super kind to the skin and scalp too. It’s scary to think that these nasties are hidden in a lot of baby and children’s ranges. This shampoo is jam-packed with organic nourishment to hydrate and enhance young hair. Plant proteins feed the hair essential nutrients, coating each strand to give a beautifully glossy and vibrant shine. Coupled with Yucca, these proteins add a softness to the hair making it tangle-free and easy to comb. 100% certified product made with 82.2% certified organically grown ingredients. Beautifully created to gently condition fine and flyaway hair. Wheat protien in this natural blend helps banish tangles and smooth the hair shaft, coupled with a strengthening complex of plant oils, rich in fatty acids, which promote silky soft hair. 100% certified product made with 89.1% certified organically grown ingredients. I would give both of these products 10/10! They smell absolutely wonderful, didn’t irritate my children’s skin, made it soft and tangle free and super shiny too! Fantastic products. The berry smoothie shampoo and conditioner are priced at £9.50 each, more information can be found here. For your chance to win a Green People Berry smoothie shampoo and conditioner (worth £19), please enter below. UK residents only. Good luck! If they are affordable I do. No I don’t. We use products like that occasionally but I wouldn’t say we purely buy organic things. The whole family try to stick to natural, organic products. Oooh these sound great! Will have to give them ago. Yes sometimes. Organic clothes are out of my budget, but I try to get organic toiletries to help my daughter’s eczema. i always try to however some are very expensive ! I sometimes use organic – depends if they are on offer! I’m always on the look out for good organic products. The world is full of so many chemicals that are harmful, especially for little ones. I do like using organic products on my children. 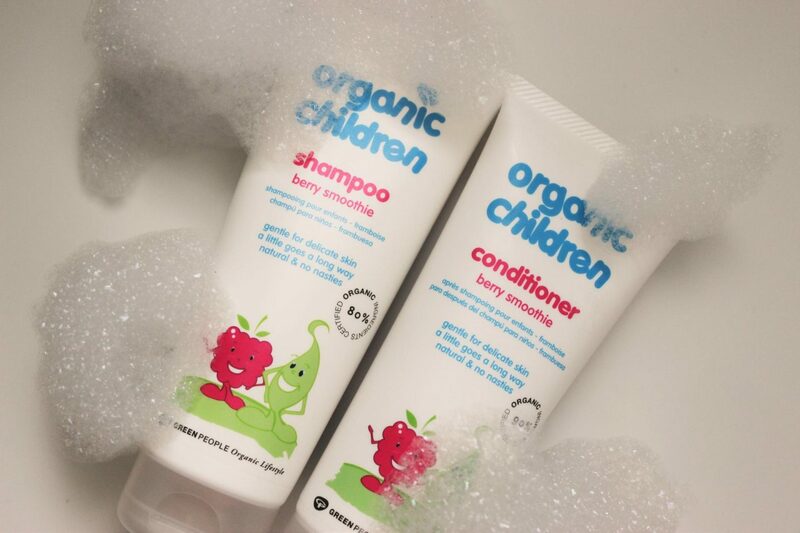 We always use organic shampoos! I love organic products and try to use them when I can. I have not try these, would love to! Sometimes if they are on offer! only if it is on offer, i find a lot of the organic stuff is more expensive. Some of my fav baby clothes are the sense organics baby grows I have! Sometimes we use organic products. I try to as much as possible!! If they are affordable, I do. Not always but would like to. Yes, I like to use organic. The truth is I don’t know if they are organic or not. I would do if they were cheaper! Sensitive skin seems to run in our family so we’ve always tried to use the simplest products we can – though not always organic. Yes, my daughter has very sensitive skin so I try to use as natural products as possible. I use organic products wherever possible, and as we’re a vegan family anyway, a lot of the time being organic comes along with it as they are often grouped together with the same products, but some organic products I do just find too expensive. I generally wait for offers and stock up! I try my best to buy organic products whenever I can. I do when i can afford it. I try to use organic products & buy organic clothing for my daughter when I can. But mostly I buy them when their on offer. Yes, but only buy them when they are on offer as they are so expensive! I sometimes buy organic body wash for my daughter but not often. We love using organic products as they are more natural. Yes I do. I also love Green People products. Sometimes, but I wouldn’t seek them out. We only use organic occasionally. I try to buy cruelty free as a rule. I try to but they are so expensive. I tend to buy them when they are on offer. The children like them better but it comes down to cost. I would love to, but they are usually too expensive. If they are affordable I do, but usually costs prohibit this. No I never used an organic shampoo. Great to discover new lines. I like to but it depends on the cost. I only buy organic items if they are not too expensive, on offer. I do use organic products, yes 🙂 My children have very sensitive skin and using organic products has really helped keep any eczema flare ups under control. I also buy organic shampoo and the whole family have noticed an improvement in our hair’s condition! I prefer too use organic, but I don’t all the time. Sometimes, just depends on where i do my shopping. Where it is possible I use organic products on my children. I do not have any children but I would try to if I did. My grandchildren’s parents try to use as many natural products as possible, particularly organic ones. i do, my kids have pretty sensitive skin! We try to be as organic as possible.